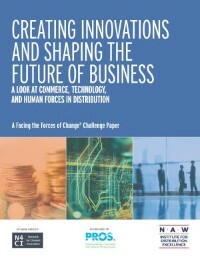 The NAW Institute for Distribution Excellence, the research arm of the National Association of WholesalerDistributors (NAW), is pleased to announce the release of Creating Innovations and Shaping the Future of Business: A Look at Commerce, Technology, and Human Forces in Distribution, the first-ever Facing the Forces of Change® challenge paper, based on research to date, including 25 innovation ideas to kick-start internal management discussions.. Please visit www.naw.org/creating-innovations or call 202.872.0885 to learn more and order copies. Quantity discounts of 15–50% apply when ordering two or more copies. This Facing the Forces of Change® challenge paper shares preliminary findings and essential insights that wholesaler-distributors can act on now. As NAW and NAW Institute for Distribution Excellence Fellow Mark Dancer work on the next Facing the Forces of Change® study to be published in November 2019, Dancer is hearing great stories of distributors working hard to innovate their businesses. There is a growing movement toward wide-spread and game-changing innovations by distributors. The challenge for distributors is to lead, disrupt and help their customers and suppliers to transform and thrive. By doing so, distributors can help define the future of business — all business — by offering innovative business services in the real world even as they fight disruption in the virtual one. Distributors can be leaders in the digital area, but only if they master the forces of change and have a plan for creating innovations and shaping the future of business. Part 1 of the challenge paper defines “distributor-led innovation” and helps distributors to reimagine what it means to be a distributor today. It includes questions distributors must answer to define their approach to channel innovation. Part 2 focuses on mastering the forces of change. Dancer asks distributors to paint their innovations from a palette of three forces — Commerce, Technology and Human Forces, and provides key questions for distributors to tackle for mastering the forces of change. Part 3 provides actionable ideas for distributors to kick-start their progress by identifying 25 innovation ideas for competing in the digital age. Distributors are invited to attend a free webinar, “Facing the Forces of Change and a Call to Action,” on Thursday, November 29, from 2:00 p.m. to 3:00 p.m. EST. Dancer will brief distribution leaders on key findings from the new Facing the Forces of Change® challenge paper. He will also share plans for collaborating with distributors as our research continues. Distribution is fast approaching a dramatic shift: from competing as legacy incumbents, to winning as innovative and entrepreneurial businesses. The path for success is emerging, but NAW and Dancer need help from distributors. Dancer will conclude the webinar with several ways for distributors to participate in and learn from his ongoing work over the next year. Joining Dancer will be PROS Chief Visionary Officer, Craig Zawada, who will discuss with Dancer the technology distributors are using today to extract actionable insights from data to make better, faster decisions maximizing revenue, deepening relationship with customers, and improving margin in the face of this digital shift. The National Association of Wholesaler-Distributors (NAW—www.naw.org) is a federation of wholesale distribution line of trade international, national, regional, state, and local associations and thousands of individual firms that collectively total more than 30,000 companies. The role of the NAW Institute for Distribution Excellence— https://www.naw.org/naw-institute-fordistribution-excellence/) is to sponsor and disseminate research and knowledge in strategic management issues affecting the wholesale distribution industry. Visit www.nawpubs.org to learn more.